The high speed mixing granulator is a new generation of wet-mixer granulator, developed based on the old model but adopting newer technologies, this model provides the perfect integration of both. Its working principle is: powdered material is mixed into a wet, soft material by the bottom mixing paddle, and then it is cut into wet, uniform granules. 1. This high speed mixing granulator utilizes a horizontal cylindrical structure, in order to cause the material to roll continually and quickly during the mixing process, thus reaching a perfect mixed effect. 2. The drive has an air-filled, sealed shaft, which when cleaning, can be changed to water. 3. Fluidization granulation creates a product with good fluidity which is suitable for the next process, such as tablet pressing or granulating. 4. Compared with the traditional process, adhesive consumption is reduced by 25%, thus the drying time is be shortened significantly. 5. 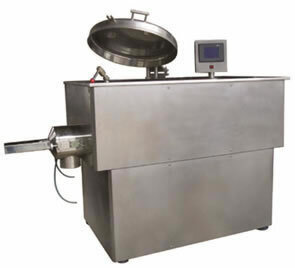 In using the high speed mixing granulator, dry mixing is done for two minutes, and then granulating for one to four minutes. This is an improvement of up to five times that of the traditional process. 6. Dry mixing, wet mixing, and granulating are all achieved in the same sealed chamber, which reduces the processing steps, and it conforms to GMP requirements. 7. The entire operation is safe. We are a high speed mixing granulator manufacturer in China. We offer various types of products such as a rotary granulating machine, circle vibrate sieve, universal grinding machine, and belt drying equipment.